After originally launching his first-generation NFC Ring via the Kickstarter crowdfunding website back in 2013, John McLear has once again taken to Kickstarter to raise funds to take his second NFC Ring into production. Building on the technology used in the first the second ring is now equipped with two independent NFC tags one on the upper surface and one on the lower. Allowing users to benefit from a wealth of different functionality, and allowing developers to incorporate the NFC tags within their applications to provide a different method of interaction. Watch the video below to learn more about the latest generation of NFC Rings that have taken to Kickstarter to raise £57,000. Have you ever wanted an easy way to share your contact details without having to scrabble around for a pen and paper, or dig your phone out of your pocket? Have you ever wondered why we rely on easily-lost physical keys in today’s digital age? Are you a firm believer that the future of technology is wireless? 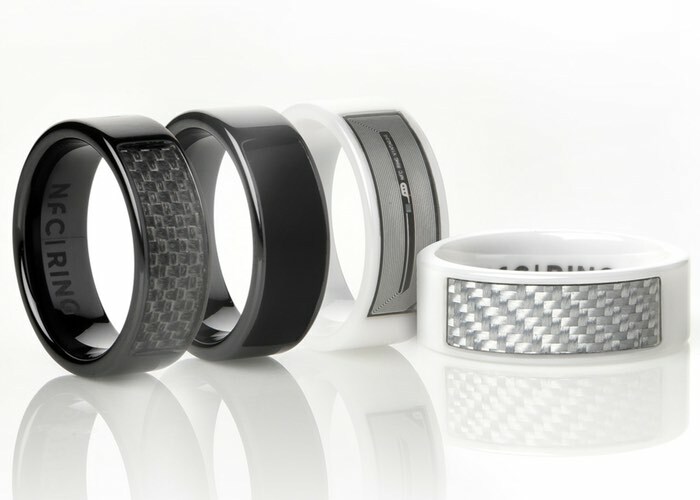 The NFC Ring combines fashion and technology into one seriously smart wearable. Adorning a finger, the NFC Ring doesn’t look out of place in the office, the home, or the even the catwalk, but its attractive exterior belies its true power. A pair of Near Field Communication (NFC) radio tags, compatible with everything from smartphones and tablets to door locks and time and attendance systems, lie just beneath the surface. Using the bundled NFC Ring Control software – or, if you’d prefer, any third-party NFC writing application – you can store your own data on the ring’s tags, completing tasks in the wave of a hand that would previously have required far more complex interactions. Jump over to the Kickstarter website via the link below to make a pledge from just £18 to make sure you own one of the very first off the production line with shipping expected to start later this year in December 2015.